Select this option if your operation voltage is 220v. This is our top of the line turnkey whole house reverse osmosis system specially designed for the homeowners with water supplies that demand advanced water treatment processing. This is the ultimate solution for high sodium, high TDS(total dissolved solids), or problematic water sources. This state of the art, low-maintenance, multi-filtration system can provide 100% soft and great tasting safe drinking water at every tap in your house- a dream for every homeowner. The whole house RO system is equipped with complete pretreatment systems(includes: sediment filter, water softener, and carbon filter to protect the RO), UV disinfecting system, and a repressurization system (to provide water pressure from the water holding tank back into your house), all pre-wired and pre-plumbed for a super easy installation. System is very user friendly and is skid mounted on a steel frame with wheels, just roll it into your house! We are providing our most comprehensive reverse osmosis system with unmatchable value in quality, convenience, and price. This whole house RO system with complete pre and post RO filtration is designed to give years of satisfying and trouble-free operations. NSF-grade high quality parts are used to build this tough system. All APEC RO systems are wet tested before shipment, and are delivered with individual quality assurance reports to show actual performance data on outputs and rejections. Sometimes referred to as a "shotgun pump", this pump uses multiple stages of impellers to create pressure for the membrane. The impellers of the pump are glass-filled Noryl with poly carbonate diffusers. The pump housing, including the inlet and outlet ports are constructed of stainless steel. The waste valve controls the system operating pressure (180-200 psi). This option allows the system to recycle a portion of waste water back into the RO system to obtain a higher feed flow recovery (up to 60%). These gauges monitor the pressure BEFORE and AFTER the system pre-filters. This allows the customer to know when to change out the pre-filters. A pressure differential of about 15 psi between the two gauges indicates the filters should be changed. Example: Pre-filter IN pressure is 50 psi and Pre-filter OUT psi is 35. This is a differential pressure of 15 psi. This option allows customer to monitor the product and waste flow rates. There is a switch box mounted on the RO system and is fused to protect the wiring from starting on fire in case of a motor problem. 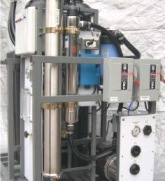 Customer can continually monitor the Total Dissolved Solids in the product water. Wood shipping crate for extra protection during shipments. High grade UV ozone generator sanitizes and disinfects water inside the tank through the highly effective oxidation process. A safe and environmentally friendly solution for quality water disinfection. This flow meter monitors the amount of water being recycled from the waste side of the membrane back into the inlet of the pump. 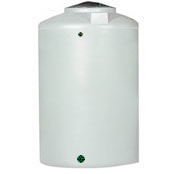 The LOGIC CONTROLLED Whole House RO system can be set up for a pressurized water storage tank. If this option is selected, it is important that the air pressure on the storage tank is set at 25 psi. Choose this option if you want to connect the system to a 3phase power supply. The Commercial LOGIC RO system is standard 110v power. Select this option if your operation voltage is 220v. This feature is a forward flow, rapid flow of water movement on the RO membrane. Flushing takes place during RO system start-up and every hour after that for 2 minute duration. Flushing helps loosen debris from the membrane surface, helping to prolong membrane life. Customer may elect this option to continually monitor the Total Dissolved Solids in the product water. This switch turns off the RO system if the pressure exceeds 200 psi. A timer will try to re-start the RO system every 15 minutes. This re-start timer can be over-ridden by pushing a button. This feature is used when a customer wishes to turn off the RO system during any pre-treatment backwashing. NOTE: The pre-treatment control valves must be outfitted with a lock-out micro switch for this feature to be operational. Diverts the permeate water to drain on system start-up for two minutes. Mostly used on high-purity water applications where the highest quality water available from the RO system is directed to the storage tank. After RO system shut-down, pure water is directed back to the RO membrane, purging all concentrated water out of the membrane housing. Ideal for high TDS applications to prolong membrane life. Hydrogen sulfide must be removed. Silica needs to be less than 125 ppm in the concentrate stream, anti-scalant should be considered for any levels over 75 ppm. Flow rates are determined by membrane manufacturer's testing criteria of 1500 ppm NaCl solution @ 77 °F water temperature and 225 psi at 10-15% recovery. WEIGHT 750 lbs. 750 lbs.